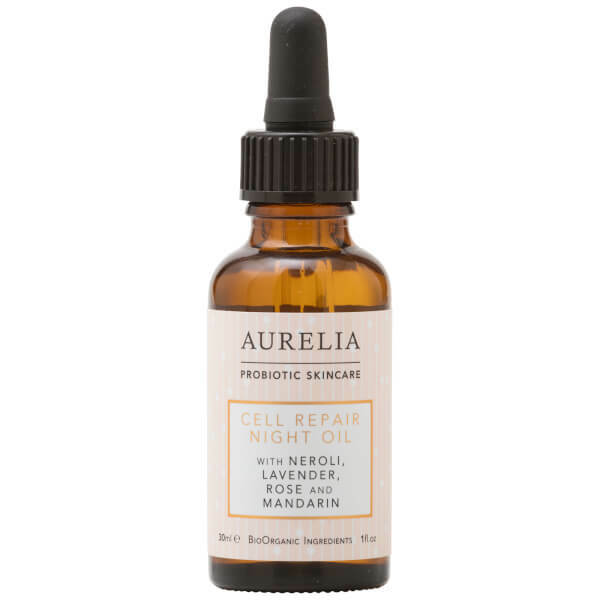 Rejuvenate skin whilst you sleep with the Aurelia Probiotic Skincare Cell Repair Night Oil; an award-winning formula that works in tandem with the skin's nightly repair process. Suitable for all skin types, including sensitive, the overnight treatment utilises Kalahari and Mongongo Oils to regenerate and strengthen skin, whilst Kigelia delivers firming and toning properties to reveal a smoother, more refined complexion. Antioxidant Hibiscus is blended with Baobab, an ingredient rich in Omegas 3, 6 and 9, to defend against the damaging effects of environmental aggressors; combating dullness and dehydration to restore a luminous, dewy appearance. Naturally fragranced with Neroli, Lavender, Rose and Mandarin, you can expect revitalised, youthful-looking skin come morning. Ideal as a facial massage oil, an indulgent anti-ageing routine before bed, or after sun, wind or extreme weather exposure. 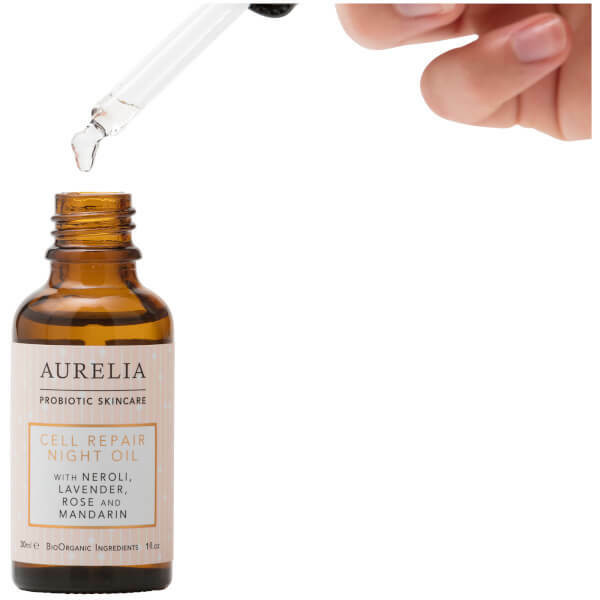 Pipette two drops into the palms of your hands, relax, inhale and massage in to your face, neck and décolletage using fingertips. For normal to combination skin, use as a treatment three times a week. For dry skin use daily. Prunus Amygdalus Dulcis Oil (Sweet Almond Oil), Cannabis Sativa Oil (Hemp Oil), Triticum Vulgare Oil (Wheat Germ Oil), Olea Europaea (Olive) Fruit Oil, Schinziophyton Rautanenii Kernel Oil (Mongongo Oil), Citrullus Lanatus Seed Oil (Kalahari Melonseed Oil), Punica Granatum Seed Oil (Cold Pressed Pomegranate Oil), Adansonia Digitata (Baobab) Seed Oil, Kigelia Africana Fruit Extract, Helianthus Annus (Sunflower) Seed Oil, Hibiscus Sabdariffa Flower Extract, Citrus Aurantium Dulcis Flower Oil (Sweet Orange Oil), Citrus Nobilis Peel Oil (Mandarin Oil), Lavandula Angustifolia Oil (Lavender Oil), Rosa Damascena Flower Oil (Rosa Damascena Oil), Tocopherol (Vitamin E), Tocopheryl Acetate (Vitamin E), Limonene*, Linalool*, Citronellol*, Geraniol*, Hydroxycitronellal*, Citral* (*naturally occurring in essential oil).